January 28th, at 3:00pm, at the [Student] Union Board meeting a resolution regarding Taco Bell will be introduced. This resolution calls for the support of the Union Board in the removal of Taco Bell from UT campus. Students are asking for support at the meeting to demonstrate a strong opposition to Taco Bell’s presence on campus. The meeting will be held at the Board of Directors Room in the Texas Union. 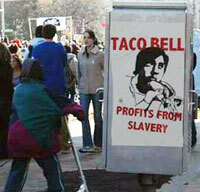 After two years of intermittent actions, picketing and educational efforts, there was a concerted effort in 2003 to remove Taco Bell for the University of Texas’ Texas Union. Students on campus, organizing under the moniker Student Labor Action Project(SLAP), have renewed that effort this year capitalizing on the expiration of the contract between the Texas Union and Aramark, Inc, who manages and operates food facilities, including Taco Bell, in the Student Union. Not only is the contract’s expiration opportune, but also SLAP’s recent organizing efforts have indeed secured the Union Board of Directors and Aramark management’s request for ‘student support’ for removing Taco Bell. Thousands of signatures calling for Taco Bell’s removal have been collected, hundreds of community members and students have demonstrated against Taco Bell’s existence on UT’s campus. Hundreds of students from around the country will be in Austin to encourage the Texas Union Board to recommend Taco Bell’s removal. This will coincide with United Students Against Sweatshops national conference Feb 11th-13th. Many area student also plan to attend the Taco Bell Truth Tour in Louisville, Kentucky February 28 through March 10 in order to highlight Taco Bell’s unfair labor practices. Several students and area activists have decided that such broader action must be taken. They plan to attend the Taco Bell Truth Tour in Louisville, Kentucky February 28 through March 10 in order to highlight Taco Bell’s unfair labor practices.